I decided to go for the initial taste test last night. 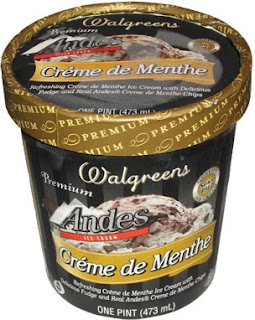 The exact description is "Refreshing Crème de Menthe Ice Cream with Delicious Fudge and Real Andes Creme de Menthe Chips". Crack open the container and you find yourself presented with a light green ice cream, a fudge swirl, and little chunks of Crème de Menthe. You know, I'm getting a little tired of typing that, let's go see what it means: Ahhh, a sweet, mint-flavored liquer. Well, now I know. sorry, enough hesitating, in we go! Yeah, now I remember why I never buy Andes mints. Don't get me wrong, its not bad. It's a fine ice cream, I just dont appreciate the flavor of it. 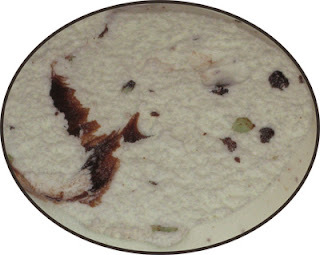 The fudge swirl is decent, but I dont know how I feel about the CdM chips. I'm just not real comfortable with that warm fuzzy Andes candies feeling being mixed with a smooth and refreshing ice cream. I'm sure there are people out there who would love the contrast, I'm just not one of them. One last thing, this is my ** 100th ** post, woohoo!